For the past few weeks, I've been taking a class in Self Awareness, hosted by my friend Dr. Tee Williams. Every week, he hosts a video call, where he asks what I thought, what I've learned about myself, and how it felt to discover these things. As I'm sure you've experienced, becoming aware of places at which we've adopted someone else's rules for ourselves, even (and especially!) where we don't agree with the premise on which they're based, can be shocking. Just like you cracked open that magazine and wrote down all your "NO" foods starting Monday, believing changing your body held the ticket to deep happiness, I've learned about emotional patterns of mine that I've thought would lead to love, safety, and confidence, that were bringing me...almost anything but that. Personal development work is not for the faint of heart. It's sticky, messy, full of more questions than answers, often leaving us wondering what the heck we've been thinking and doing our whole lives. 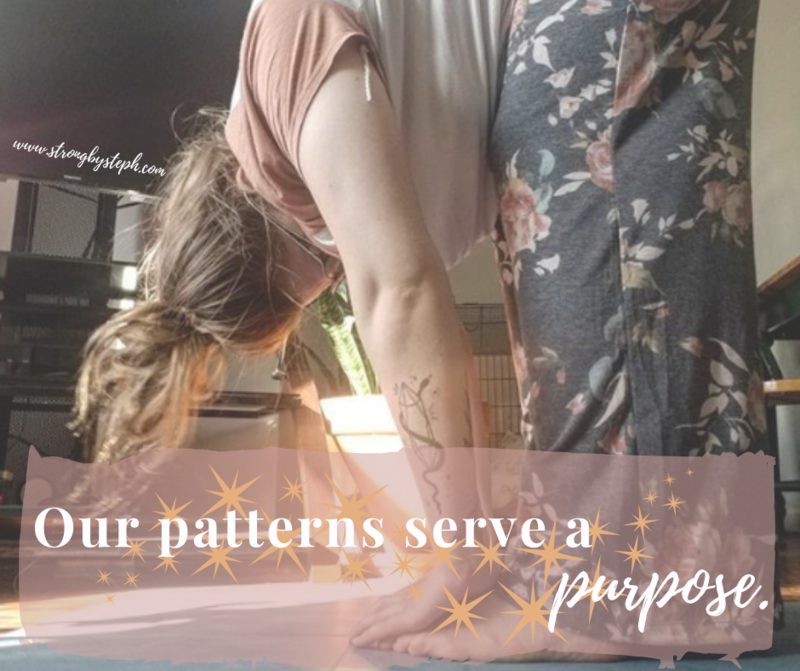 Yet, as Dr. Tee continues to point out to me every time I'm ready to throw my hands up and abandon this exploration of myself, our patterns serve a purpose. One of the most common places I notice gnarly patterns in my clients is around body image. Most of us internalize an array of problems and take them out on our bodies. Have you ever felt like you’re failing at work/momming/partnering and buckled down on your diet? Felt like you’re drowning in any/all of the aforementioned activities and found freedom in a whole box of Thin Mints, to end in the, “see, I AM drowning; I can’t even stop at three cookies,” shame spiral? Skipped one workout and told yourself you’re wrong and terrible and vowed to work out 6d/week to get rid of your visual signal of failure (a love handle, a bat wing, a roll, take your pick? Instead of willing this pattern away (how’s that going? ), what would happen if you saw it for what it is—protection? You don’t want to believe you’re a failure (who does? Also, you aren’t). Life happens. Things don’t go as planned. What happens next? You protect yourself from failure by promising to succeed, whatever it takes, immediately. “Whatever it takes,” is usually pretty harmful, but we don’t see that part; we see problem → solution. And what if you realized in some ways, that’s beautiful? What if you acknowledged that at one time, for some things, it worked? What if you saw that it’s there for *exactly* that reason—on some level, this pattern has delivered what it promised. Wouldn’t it be easier, this way, to let it go? Wouldn’t it feel better to say, “thank you, extreme cycle, for protecting me when I needed you, but actually, I’ve grown a lot since we started down this path, and I recognize I can make different choices, so I’ve got this from here,” and then practice doing something (anything) else? PS- these questions don't have to be rhetorical if you don't want them to be. ;) I'd love to chat with you about them! Comment and let me know what you think, how you see patterns play out in your fitness journey, and where you'd like to go next.